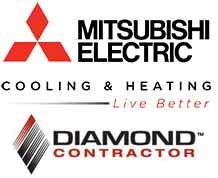 Newmarket, NH; July 18, 2017 - We are pleased to announce that Proulx Oil & Propane has achieved Diamond Contractor status for Mitsubishi Cooling & Heating. Diamond Contractors are independent dealers who have invested time in training at an approved instructional center and have a high level of experience working with Mitsubishi Electric systems. Customers can be confident of full warranty protection, installation and service by purchasing their Mitsubishi system from Proulx Oil & Propane. For more information on the complete line of Mitsubishi cooling & heating systems contact our sales team at 800-287-1921 or at CSR@ProulxOilandPropane.com.